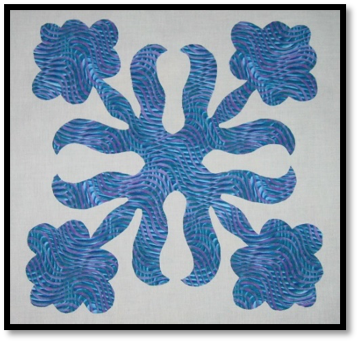 Description: Don’t be intimidated intricate Hawaiian appliqué blocks. Kathy will show you how to design and make these using a raw-edge appliqué technique. She will share her original patterns and provide hints for creating Hawaiian designs. Students will learn to fold and cut freezer paper to make their design. It will be fused to the appliqué fabric and the edges will be machine appliquéd. Borders may be added after class to make this project a wall hanging or pillow. These blocks can be finished within three hours. They are very addicting so don’t plan to just make one. 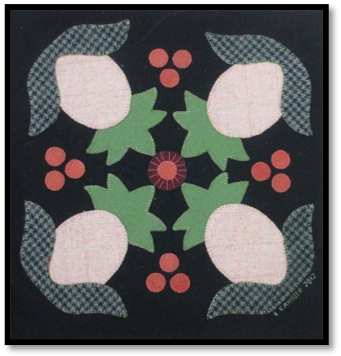 There is a kit for this class that includes detailed directions and four sample patterns, a wide choice of batiks for the applique motif, Kona cotton for the background (white or black) and decorative polyester thread. Each student will need a sewing machine. Note: Because this is a three hour workshop, there will only be time to make the block. There will not be time to learn and add stitches to the project. If this class is expanded to a six hour workshop, there will be time for the students to learn and stitch the short interior lines of the block. 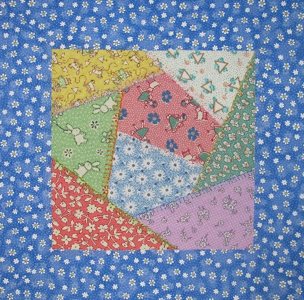 Description: Learn to make a crazy quilt block using cotton fabrics with fused and overlapped raw edges. Inner and outer borders will be added to the block. This process is fast and easy and will produce flat edges for the addition of crazy quilt stitches. 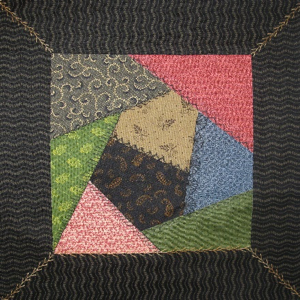 Kathy will discuss adding crazy quilt stitches, beads, embellishments, laces and silk ribbons. 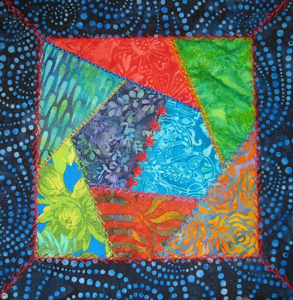 One crazy quilt block will be made during the workshop. It can become a pillow, small wall hanging or table topper. This is a fast and easy project that makes a great gift. It’s fun to see the different fabrics that students bring for this project. Students will bring their own fabrics for this workshop. Any fabric line or theme works and they make great decorative table toppers. No sewing machines are needed for this class. Description: This cute little table topper measures 14” across. Learn to fuse and hand stitch the center design in place. Kathy has a simple way to add and stitch the 14 hearts around the perimeter. There is a kit for this class. 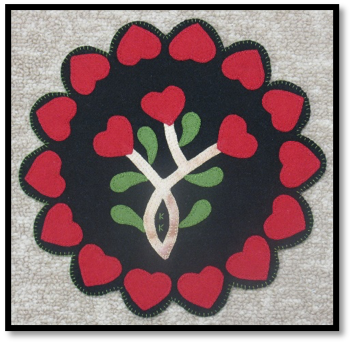 It includes the pattern and directions, black wool for the background, hand-dyed wool for the stems and leaves, solid red wool for the hearts, a brushed flannel print for the backing, chenille needles and Valdani threads. Students will not need a sewing machine for this workshop. 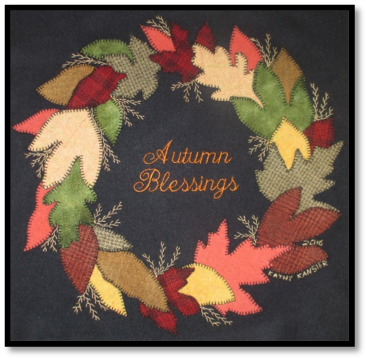 Description: This 15” x 15” table topper or pillow can be displayed in your home every fall. Learn about shape and color placement as you design and layout your wreath. It will be fused in place and finished with hand embroidery stitches. There is a kit for this class. It includes the pattern and directions, black wool for the background, hand-dyed wool for the leaves, a wool plaid for the backing, chenille needles and Valdani threads. Students will not need a sewing machine for this workshop. Description: Did you know that the 19thc. ship captains returning from a voyage to Hawaii would display pineapples by the entrance of their house to let people know they were home and visitors were welcome? The pineapple soon became the symbol for hospitality and is still used today. It can be found in wreaths, quilted wall hangings and on welcome signs. This 15” x 15” table topper or pillow is made entirely with wool. Learn about working with wool and accurate placement with this project. The design elements will be fused in place and finished with hand embroidery stitches. There is a kit for this class. It includes the pattern and directions, black wool for the background, hand-dyed wool for the pineapples, leaves and circles, a wool plaid for the backing, chenille needles and Valdani threads. Students will not need a sewing machine for this workshop. Description: This 15” x 15” table topper or pillow is made entirely with wool. Learn about working with wool and accurate placement with this project. The design elements will be fused in place and finished with hand embroidery stitches. There is a kit for this class. It includes the pattern and directions, black wool for the background, hand-dyed wool for the basket, branches, birds, leaves and circles, a wool plaid for the backing, chenille needles and Valdani threads. Students will not need a sewing machine for this workshop. Description: The poinsettia is native to Mexico. The Aztecs used the plant to produce a brilliant red dye and also to make a medicine to reduce fevers. 17th century Catholic churches in Mexico used poinsettias to decorate altars on Christmas Eve. They believed the star shape symbolized the Star of Bethlehem and the red represented the blood of Jesus. In 1825, the flower was named after Joel Roberts Poinsett who was an American missionary in Mexico. 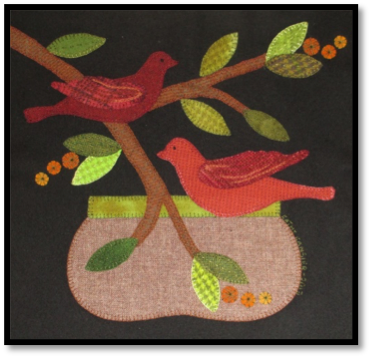 This 15” x 15” table topper or pillow is made entirely with wool. It is perfect for the Christmas season. The four layers of the design are all the same shape in different sizes. Learn about working with wool and accurate placement with this project. The design elements will be fused in place and finished with hand embroidery stitches. There is a kit for this class. It includes the pattern and directions, black wool for the background, red and green hand-dyed wool for leaves, a wool plaid for the backing, chenille needles and Valdani threads. A vintage button can be used in the center. Students will not need a sewing machine for this workshop. Description: This 15” x 15” table topper or pillow can be displayed in your home every Christmas. The design elements will be cut and fused in place and finished with hand embroidery stitches. There is a kit for this class. 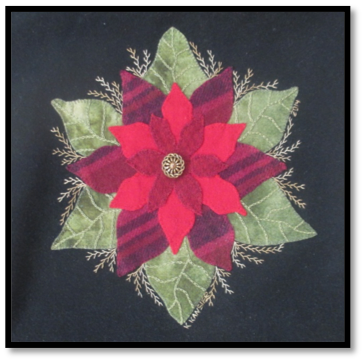 It includes the pattern and directions, black wool for the background, hand-dyed wool for the poinsettias and holly leaves, bow pre-cut circles, beads, a wool plaid for the backing, chenille needles and Valdani threads. Students will not need a sewing machine for this workshop.